Sadly, we are left to wonder. We know from his work on the software that would become SecureDrop that Aaron believed in making the world a safer place for whistleblowers to expose injustice and wrongdoing. We are all worse off without the passion and curiosity he surely would have brought to Edward Snowden's continuing disclosures about NSA spying. We are reminded of Aaron as we push forward in our court cases against the NSA, help organizing against the spying with the stopwatching.us coalition, evaluate the Congressional proposals and, of course, as we continue to build and support technologies that let people take their privacy into their own hands. Aaron understood deeply that, more than ever in a world where information is power, both legal and technical protections for privacy are essential to keep people from being rendered powerless. At the same time, he recognized that access to information can help to correct the systematic power asymmetries that preclude real accountability for the institutions that should defer to the will of the people. His conviction shone through in work to free the court records that make up the common law in the United States but which are often locked behind the PACER paywall. That struggle continues, and we are proud to defend Carl Malamud—an ally of Aaron's who delivered a stirring call to arms at last year's memorial—in his ongoing efforts to ensure the public has access to the law. Aaron was an idealist who dreamed of opening up information far beyond just the law, though. The public deserves unfettered access to the products of publicly funded research and our shared culture, and he saw how the Open Access movement could play a part in that. He may have been heartened to see the great strides that movement has made in the past year. Aaron didn't get to see the White House come out strongly in support of Open Access for research funded by the federal government, or the FASTR bill, which you should tell your lawmakers to support, but we can hope he would have been pleased. 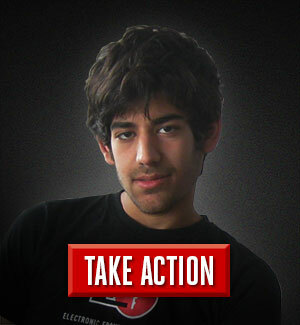 Of course it was ultimately an effort to download scholarly works—and a shameful failure by the Massachusetts Institute of Technology to take even minimal steps to defend him as a member of their community or even explain that his access was not “unauthorized”—that led to his charges under the Computer Fraud and Abuse Act (CFAA).In the year since his death, we've learned a bit about the notorious prosecution, although there is still much left shrouded in unnecessary secrecy. We have also pursued reform of that hated, outdated law. Aaron's Law was introduced in June of last year by Representatives Zoe Lofgren, Jim Sensenbrenner, and Senator Ron Wyden, and it still represents the best legislative effort to fix the CFAA's serious flaws, by limiting the meaning of "without authorization," and adjusting the penalties. The existing law's vague definition of that phrase is one of the defects responsible for the CFAA's overbroad and overbearing application to many cases involving technology and EFF continues to defend those charged under the CFAA even as we work to fix the law. Aaron’s Law is a start. More should be done, but this is an essential fix to make. And it needs your support—tone-deaf legislators have insisted on drafting bills with provisions that amplify the CFAA, when the opposite is needed, including one introduced just last week. Aaron had a gift for identifying the problems that mattered, mapping a theory of change, and then taking it on, step by step. That approach allowed him to undertake challenges that many people, most people, would dismiss as impossible. That may be the greatest legacy of the central role he played in the historic SOPA blackout protests: he dreamed a way that an individual could make a small difference, and enough acting together were unstoppable. It takes a tremendous human spirit to look at the failures of the institutions around us—from the breakdown of governmental checks and balances to its war on whistleblowers to the tremendous corporate influence on crafting anti-user policies—and not despair. Aaron taught us that we must not. He's inspired people to take up big challenges not out of reckless optimism, but because he believed that if we can see the change we want in the world, we are powerful enough to make it happen. From Lawrence Lessig marching across New Hampshire to address corruption in politics, to public interest groups banding together for a day of action against NSA spying, that legacy lives on. We gave Aaron a Pioneer Award last year and continue to fight in his honor. Join us by demanding a fix to the CFAA and joining our month of action against censorship and surveillance and toward open access. Because in the end, the way to celebrate Aaron’s life is to come together and continue his work.